Today, I was back to my regularly scheduled programming, which was tough. I suppose it’ll be tougher tomorrow, when I have to actually go back to work. But, with the whole ‘working for myself’ thing, I haven’t made any money in three weeks, so back to work it is. I ran ten miles today and barely made it the full ten. I even tripped over my own feet more than once. I also had to dodge 60-70 mountain bikers on the trail. That isn’t an exaggeration. On the weekends, it’s a popular mountain bike trail, so there were a good number of groups and families out. The trail is also used for a program taking inner city kids into the outdoors — on bikes. Five of those groups of leaders + kids passed me, in addition to the regular mix of weekend warriors and small children. At that point, I’m not going to stop for every single mountain biker. That’s not bitchy, right? I just move to one side and keep running. The only problem is some of these kids learning about the outdoors don’t have amazing handling skills. Not that I’m going to hate on anyone’s poor mountain biking skills. Kettle. Black. But, still, it makes it rough. The kids are also practicing their trail etiquette, so instead of one person yelling, “Runner Up,” every single kid yelled it. It was cute/annoying. About halfway through, I was doing a pick-up effort at about 6:30 pace and a group of kids + leader passed me going the other way. One of the kids yelled, “Jogger Up.” If I’d been near the end of the effort I might have stopped and done some explainin’. Look, kid, this is not a jog. I am definitely going harder than you are. But, I was too tired. So, I didn’t. 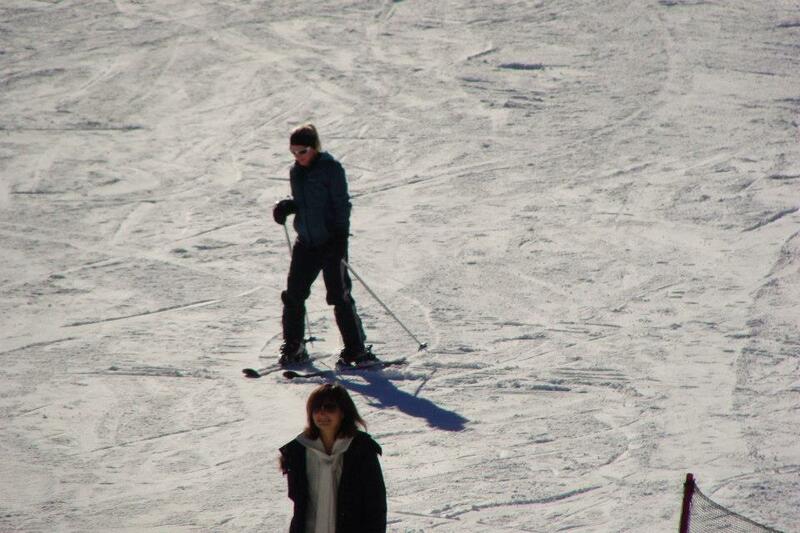 This is the only photo of me actually skiing. Eat your heart out. I say ‘skiing,’ because I don’t ski. I have skiied four times in my life and twice was in the Midwest, so that evidently doesn’t count. The last time Steve and I went three years ago at Dodge Ridge, it didn’t go well. We don’t talk about that. So, this time, I started out very slowly and worked my way up the mountain. Eventually, I was able to do a few long blue runs all the way from the top. I would say I only fell a few times, but it might be more accurate to say I only totally wiped out a few times. I fell plenty. Still, I only got a couple blisters and no new concussions. We’ll call that successful. 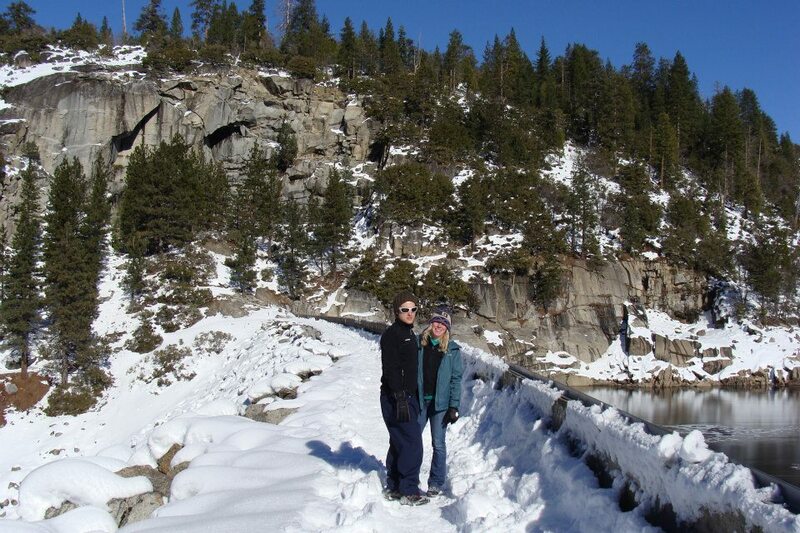 I also ran a little bit in the snow (and ‘hiked’), which was also exhausting. Doing drills in a semi-plowed parking lot, I accidentally ran backwards into a snow drift. Not a peril that I encounter regularly. Back to normal it is. 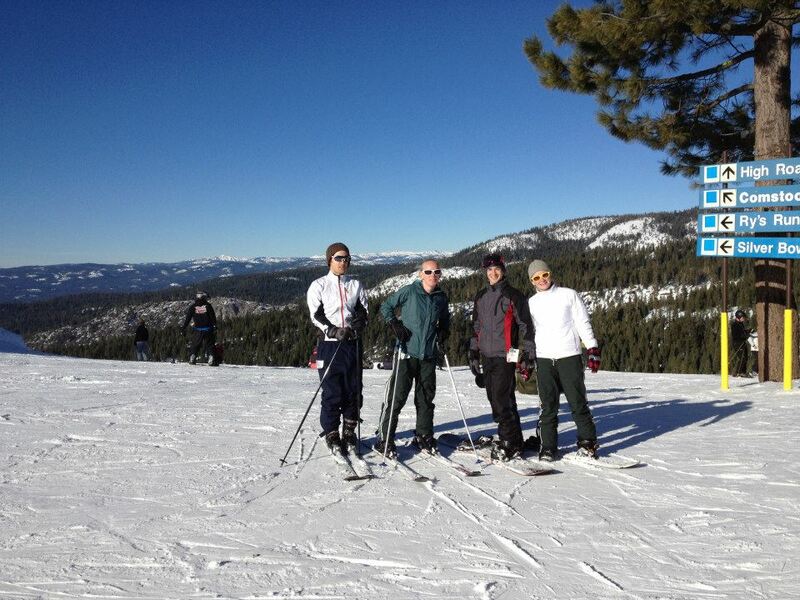 Steve, me, my sister’s boyfriend, Jake, and my sister, Maggie, near the top of the mountain. Previous Post What would Lance Armstrong gain from admitting anything? Next Post In case you want other blogs to read besides mine obviously, here are some suggestions.